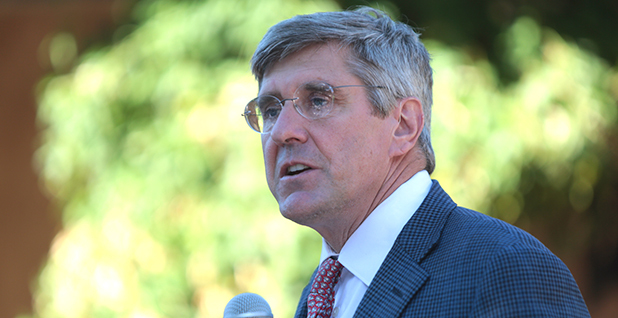 Stephen Moore, a senior fellow at the Heritage Foundation, told E&E News in a brief interview yesterday that the Fed should not consider the risks that rising temperatures could have on the economy because it was not tasked with addressing environmental policy. "The Fed's job is to keep prices stable; that's all it is. It's not to get involved in political and policy issues," Moore said. "It's to maintain a stable price system with high employment." Moore's nomination comes as calls rise within the Fed to consider the economic effects of climate change. Chairman Jerome Powell, who Moore has called on to resign, told lawmakers earlier this year that he was looking into how the Fed should incorporate climate change into its planning. Moore has a long history of rejecting climate science and recently claimed that scientists were motivated to make global warming seem risky because it could help them obtain research funding. Yesterday, he said addressing climate change is an issue for EPA, not the Fed. "The Fed doesn't have scientists on board; it has economists, not scientists," he said. "I don't think the Fed should be involved in environmental issues; I think the Fed should be establishing high employment, stable price system. It doesn't get involved in legislation." Glenn Rudebusch, a senior policy adviser at the Federal Reserve Bank of San Francisco, wrote last month that climate change was one of three factors transforming the economy, along with the shift toward an older population and rapid advances in technology. "For the Fed, the volatility induced by climate change and the efforts to adapt to new conditions and to limit or mitigate climate change are also increasingly relevant considerations," Rudebusch wrote. "Moreover, economists, including those at central banks, can contribute much more to the research on climate change hazards and the appropriate response of central banks." There is mounting evidence that climate change could negatively affect the economy. The National Climate Assessment, released by the Trump administration in November, found that it could cost hundreds of billions of dollars in the coming decades, though exactly how is unclear. Along the Gulf of Mexico, damages could tally $5 billion annually and more than $13 billion by 2050, according to the assessment. Twenty percent of at-risk assets could reside in the oil and gas industry. In about 30 years, sea-level rise alone could devastate coastal real estate values and businesses, the report found. "More than 5,790 square miles and more than $1 trillion of property and structures are at risk of inundation from sea level rise of two feet above current sea level — which could be reached by 2050 under a high rate of sea level rise, by 2070 assuming a lower rate of rise, and sooner in areas of rapid land subsidence," the assessment found. Last week, Trump said he was also nominating former presidential candidate Herman Cain to the Federal Reserve Board. Cain, a Republican, has a history of denying climate change, and he has said climate scientists falsified their findings to make them look more dire. Moore, when asked why the Fed shouldn't incorporate climate change into its analyses, said the agency is a "nonpolitical organization and it should not get involved in policy issues in front of the Congress." He also said the Fed should have no role in the Green New Deal but claimed the broad-based resolution would devastate the economy. "That would be very negative for the economy," he said. "In my estimates, we're talking about a hit to the economy that could be in the trillions of dollars."